When we first started planning our Rajasthani adventure back in Delhi, a Shanti Home employee told us we would never want to leave the relaxing lakes of Udaipur. Little did we realize at the time just how long we would, in fact, call Udaipur home. The gameplan for the rest of our time in India was to take the 12-hour night train from Agra all the way out to Udaipur, and then work our way back through Rajasthan to Delhi stopping in Jodhpur, Jaipur, and any other "pur" along the way. We arrived in Udaipur at 7am, checked into Bhanwar Vilas hotel, and commenced with our usual introductory wander around town. By the time we sat down for lunch four hours later, Patrick was having some major abdominal pain. We figured we would relax in our cool and comfortable hotel room until the storm blew over. When the sun set and Patrick was still in pain we decided to go to the hospital. Our best option for transport was autorickshaw--a 3.5 km ride careening through narrow streets that Patrick remembers as "like a Disney World ride" and Katrina remembers as very messy. It didn't take long for the hospital to diagnose kidney stones and we moved in to the room in which we'd live for the next five days. It was definitely not what we would expect from a hospital room: two beds that looked like something Orphan Annie would sing about, something resembling a coat hanger coming from the wall on which they hung Patrick's IV drip, a bedside table lined with old newspaper, and a small, unlined, pink plastic trash bin under the bed that was used for all disposals. There was no soap, let alone toilet paper, in the attached bathroom. This did not inspire confidence. After a series of sonograms and x-rays (delayed by Patrick's inability to "pass a motion" as they called it, and we aren't referring to a legislative point of order) it was determined that the stone was so massive that it was completely blocking his left kidney function and two procedures would need to be done. 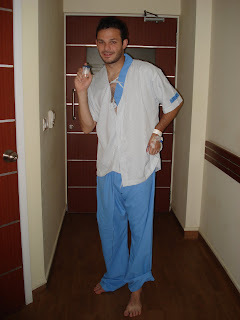 Patrick decided to undergo only the time-sensitive procedure in Udaipur so as to minimize our stay there, and then we'd go back to Delhi to finish fixing him up. It's pretty scary to deal with any medical emergency, but even more so when things are getting lost in translation. There were not only language barriers but also subtleties in ways of communicating. Sometimes interpreting gestures was like being diagnosed by a Magic 8 ball...do repetitive side head bobs mean yes, no, or "ask again later"? And we hadn't realized the importance of verb tenses. The stone blockage is damaging, has damaged, or will damage the kidney? We spent about a half hour with multiple doctors on that one. 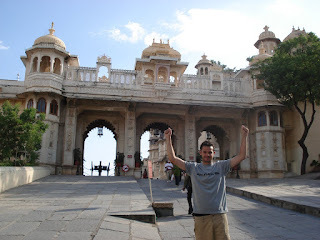 We were relieved to be dischar ged and had about 24 hours in Udaipur before our appointment with a urologist in Delhi. This meant that we finally, after a week of being in town, had a chance to see the City Palace that is Udaipur's main attraction. This palace is the largest and one of the oldest in Rajasthan--and absolutely beautiful. We saw tiled mosaics, Indian-style stained glass, and meticulously carved marble screens as we hiked through the massive maze of halls and courtyards. Our discharge was also very timely as it coincided with Diwali. Many Indians described this holiday as their version of Christmas, a comparison reinforced by the hundreds of commercials we'd watched during our week in the hospital advertising presents for Diwali. There is gift giving, exchanging of sweets, and a big emphasis on lights. From our rooftop deck that night at Bhanwar Vilas we saw Udaipur aglow with buildings shrouded in strings of lights, kids setting off firecrackers from the streets below, and fireworks shooting from a dozen roofs around us. 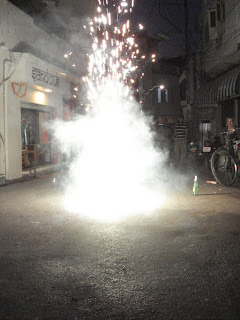 It was a very Happy Diwali. The next day we flew to Delhi to complete Patrick's treatment with a surgical stone removal at the wonderful Artemis Hospital. Here we became familiar with the term "medical tourism": Artemis is a destination for Americans undergoing expensive procedures not covered by their insurance back home, which they can get at a fraction of the cost in India. There were seven other "international" patients on our floor alone. They took great care of us during our four day stay, and we've collected their brochures on rhinoplasty, breast enhancement, and botox to bring home for anyone looking for budget plastic surgery. Leaving Artmeis was nothing short of excellent, if for no other reason than to be liberated from Indian hospital food. It might be a while before Patrick goes near Masala anything again. What Patrick will miss though is his weekly pre-op "Indian". After a few days laying low in a hotel room to complete Patrick's recovery it is now off to southeast Asia to start a new, hopefully calculi-free chapter of the trip! 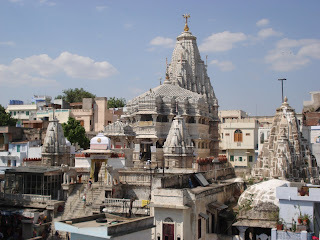 View more pictures from Udaipur here. Biggest unanswered question: did they give the stone back to you as a souvenir? We do in fact have the little guy in our possession. We are considering taking it out with us and snapping some pics...lounging on the beach, sightseeing at temples, on safari, etc. I just love your story. we just came back from India. We visited Delhi,Agra and Calccuta. We fell in love with the culture and people. Our turist guide is from Udaipur and he told us that next time we visited India we should go there. Well I can't wait to go back. That's why I am looking at pictures and everything I can find from there. 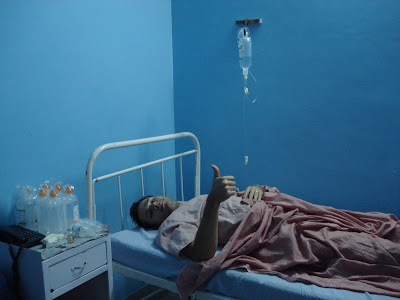 I am glad your husband is fine now, and despite the conditions of the hospital I know people were nice to you. I laugh so much at the "repetitive side head bobs" I was woundering that myself. Anyway if you want to see our pictures this is my facebook account zynthiacobb.Good luck on your next trip!! Oh man, what a place to get a kidney stone! As a Urologist, I know how hard that must have been! If you visit, let me know what you think! What an adventure! Poor guy--must have been a bit scary. Glad to hear all turned out well. Kidney stone treatment in India has become one of the most successful, sophisticated & safe medical procedures performed. India is one of the best destinations for international medical tourism which have top quality medical expertise to offer but also have great travel destinations like Goa and Kerala, Delhi,where one can enjoy a medical vacation. Hospitals are internationally accredited for their amenities and skilled surgeons providing low cost cataract surgery in India. Do you want to sell your kidney? Are you seeking for an opportunity to sell your kidney for money due to financial break down and you don’t know what to do, then contact us today at APOLLO HOSPITAL and we shall offer you( $4,000USD) for your Kidney.